AKEED MOFEED (GB) (Bay 2009-Stud 2014). 6 wins-1 at 2-from 1400m to 2000m, Hong Kong Cup, Gr.1, Hong Kong Derby, L. Brother to SW Jordan Sport (Meydan Mahab Al Shimaal S., Gr.3). Sire of 19 rnrs, 8 wnrs, inc. SP Sunset Watch and of Assertive Play, Heart Conquered, Poised to Strike, Akeed, Avora Sun, Inkslinger, Swing it Sister and of the placegetters Burning the Clock, Caterham, La Vita, Lunch Money, Surreal Image, etc. His oldest progeny are 3YOs. MALALA, by Strada. Winner at 1200m in Aust. This is her first live foal. Short. 3 wins to 1500m to 2017-18 in Aust. Carricks Corner. Placed in Aust. RINGERDINGDING (Sebring). 4 wins-1 at 2-from 1100m to 1600m, A$347,295, to 2018-19, MRC Sandown Guineas, Gr.2, VRC Springtime H., L, ATC Casino Prince at Vinery 2YO H., 2d MVRC WM Waste Management P., 3d MVRC Red Anchor S., Gr.3. Salome (Unencumbered). 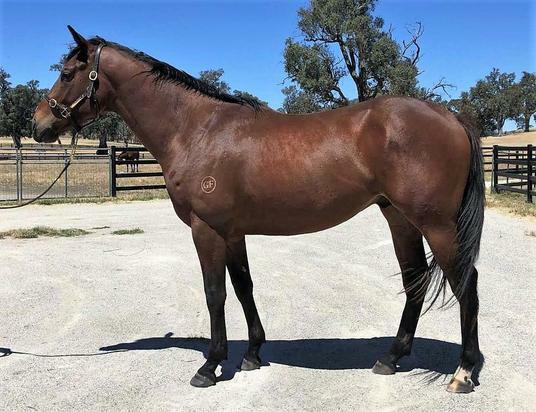 Placed at 2 in 2018-19, 3d MVRC Inglis Banner 2YO S., RL. Fort Courage (General Nediym). Winner at 2, A$144,990, WATC McKenna Hampton Insurance 2YO P., 2d WATC Fremantle Legacy 2YO H., Westspeed 2YO P., Combined Metal Industries H., Crown Metropol H., Facebook.com Perthracing H., Racingjobs.com.au H., Wine Appreciation H., Tabtouch.mobi H., Perthracing.org.au H., Perth Ice Works H., 3d WATC Aquanita S., L, Fairetha S., L, Crown Perth H., Twitter.com Perthracing H., Skyy Vodka H.
Flight Queen. 4 wins-1 at 2-from 1300m to 1800m, R238,030, 3d Clairwood Umsinzi H. Producer. Maybe Us. 3 wins at 1300m, 1400m, 3d WATC Westspeed 3YO H.
Flitero. 4 wins from 1350m to 2200m, A$162,850, ATC Vincents Country Classic P., BRC Construction Skills Qld H., Brc.com.au H., 3d ATC TAB Highway H., SCTC IGA H., Ipswich TC Ray White H.
JESSY BELLE (Rock of Gibraltar). 8 wins from 1200m to 2000m, A$784,425, VRC Matriarch S., Gr.2, Leilani Series Final H., MRC Sportingbet.com.au H., MVRC TM Design Inglis Bonus H., VRC Leilani Series Heat H., MVRC Emsley Lodge H., Sportingbet H., 2d VRC Vintage Crop & the Curragh Racecourse H., MRC Bert Bryant H., Sportscover Insures VAFA P., PSC Insurance Brokers H., 3d VRC Blazer S., Gr.2, MRC Tristarc S., Gr.2, BRC Dane Ripper S., Gr.2, MRC How Now S., Gr.3, ATC Lord Mayor's Cup, L, SCTC Ascot H., L, MRC Ern Jensen Funerals H., MVRC Slickpix H., 4th VRC Let's Elope S., Gr.2, Frances Tressady S., Gr.3. Conrod Straight (Danzero). 4 wins-1 at 2-at 1000m, 1100m, A$134,200, AJC Harrington Park H., Stargames 2YO H., QTC XXXX Gold H., STC Nivea Visage H., 2d STC Eskimo Prince H., L, St Marys Leagues Club H., BTC Suncorp Commercial Intermediaries H., 3d VRC Moomba P., L, STC APN Outdoor H.